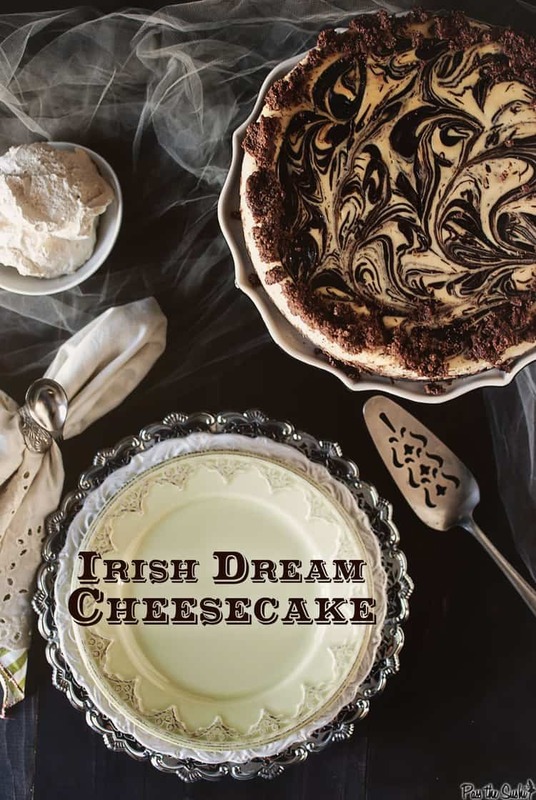 This Irish Dream Cheesecake is a smooth creamy classic, updated with everyone’s favorite after dinner cocktail. The perfect way to finish off a meal, or when you just want something decadent. But what about Pass the Sushi, the adoring fans cried out into the night. Pass the Sushi is and always will be my little corner of the web. And no worries, it’s not going anywhere. It has grown and become more than a few food goals to get myself eating from the kitchen and cooking more, into a fun place where I can share stories and food with you (and random strangers) on a day to day basis. But it never had a niche. I post what I want here when I want. Now, For this Irish Dream Cheesecake. For more decadent desserts, click here! You won’t be disappointed. 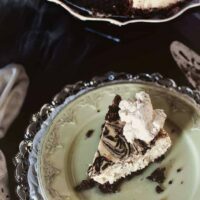 If you’ve tried my Irish Dream Cheesecake recipe, or any other recipe on passthesushi.com please don’t forget to rate the recipe and let me know where you found it in the comments below. I love hearing from you! You can also follow along for more good eats and travel tips on Instagram @passthesushi & @girlcarnivore, Twitter & Facebook. Pulse the cookies in a food processor until they are a fine crumbs. Add the salt. Coat the bottom of a 10" springform pan with a little bit of the melted butter. Toss the crumbs with the rest of the butter. Set aside 1/2 cup of the crumbs. Press the rest of the crumbs into the bottom of the pan. Bake for 6 minutes. Set aside to cool. When cool enough to handle, wrap the pan in two layers of heavy duty aluminium foil. In the bowl of your stand mixer, fitted with the paddle attachment, whip the cream cheese on medium speed for 2 to 3 minutes. Add the sugar, mix for two minutes longer. Reduce the speed to medium-low and add the eggs one at a time scraping down the sides after a few to make sure all things are combined. Add the vanilla, liqueur and heavy cream. Increase the speed to medium and mix for 4 more minutes, stopping the machine and scraping the sides halfway through. Pour the batter into prepared crusts. Pour the melted chocolate over the top and using a butter knife, swirl about, taking care not to touch the bottom. Place the springform pan in a large baking dish with high sides. 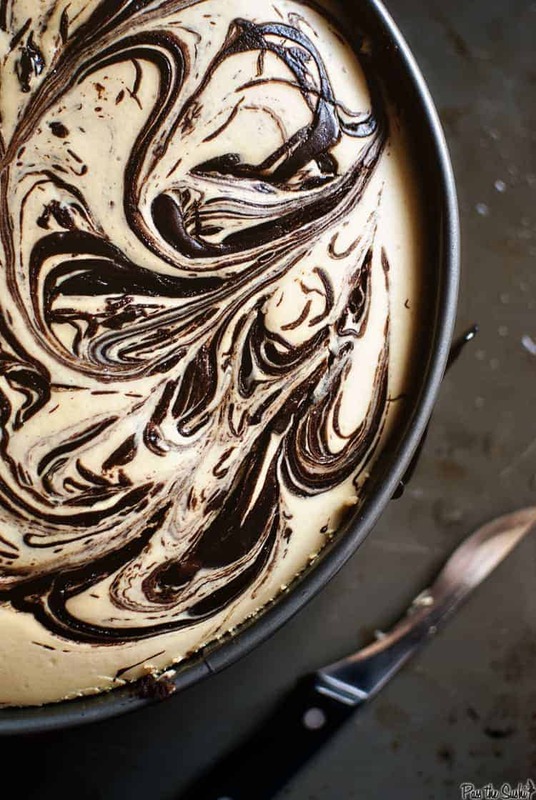 Fill the pan halfway with boiling water, taking care to not spill any water in cheesecake, making a water bath. Bake for 25 minutes. 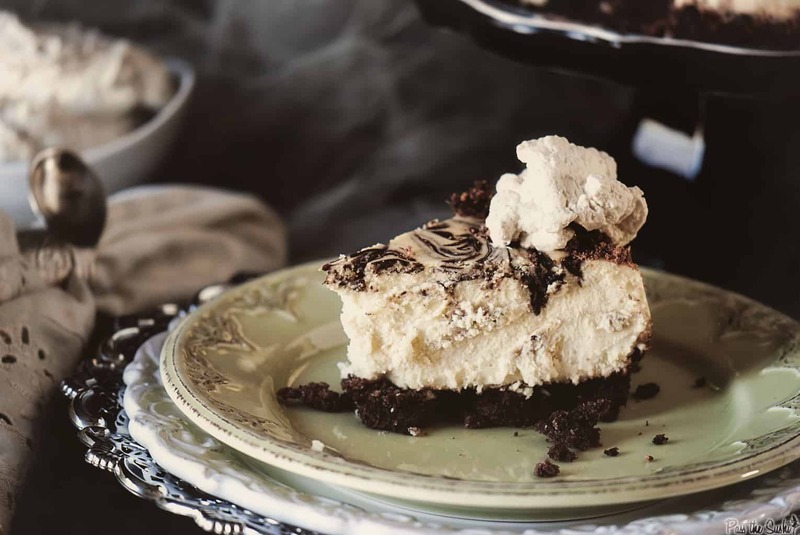 Without opening the oven, reduce the heat to 225 and bake for 1 hour 45 minutes longer or until the middle is no longer shiny and the cheesecake is firm. Remove the pan from the oven and water bath. Run a thin knife around the inside edge of the pan. Let cool completely then loosely cover and refrigerate for at least 6 hours. Combine the instant coffee with the hot water until dissolved. Whip the heavy cream with the sugar until soft peaks form. Add the cooled coffee and whip 45 seconds longer – being careful not to beat too dry. Sprinkle reserved crumbs around the edge of the cake. Serve with the whipped cream! This gorgeous and looks so delicious. I am happy to see a St. Patrick’s Day dessert that is not green. This looks incredible! So excited for your new blog! This sounds so freaking awesome! Dreamy for sure! Oh wow this is from Guy Fieri’s cookbook too? This cookbook club is going to make my collection even larger than it is already! Hi Ashley, Irish cream is a cream based whiskey drink. I often use Baileys or Carolans. It is quite dreamy in a glass with just some ice. Wow, so pretty! 🙂 That looks SO delicious. 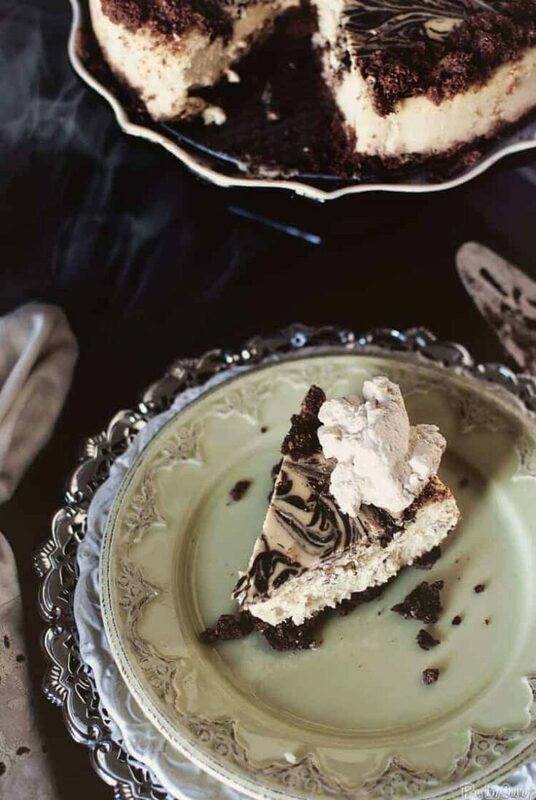 Your cheesecake look to DIE for and I love your “Girl Carnivore” can’t wait to all the yumminess over there too! I’m a huge lover of cheesecake and thisparticular cake looks very delicious. Beautiful! Have a Happy St. Patrick’s Day! Subscribed! I saw “Master Mops” and “Conquer Smoke” and I AM IN. I bought my hubby a smoker last year (late in season) and I am excited to see what you post! I would LOVE to dream of this cheesecake tonight! Best of luck with the new site! Love the new site – who doesn’t love a girl site dedicated to all things meat! Bring it on! This looks great, there’s no way I’m waiting until next year to try it either! Oh yum, your cheesecake looks divine!